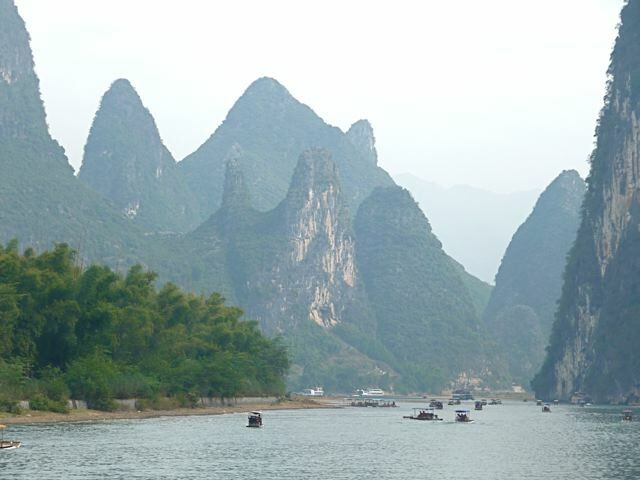 There is a saying in Chinese: 桂林山水甲天下，陽朔山水甲桂林 (Guilin’s sceneries is the best in China, and YangShuo’s sceneries is the best in Guilin). 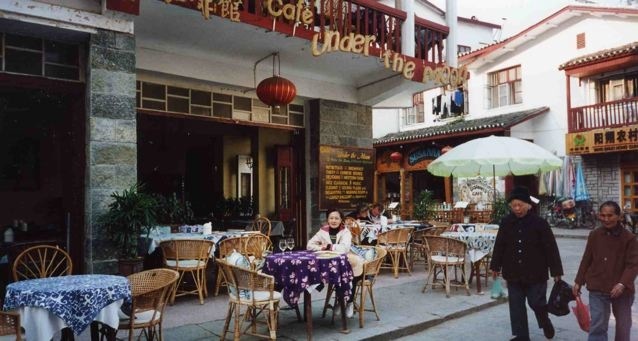 Sally and I found this to be true, and we found the most tranquil inn in YangShuo. In fact, this inn is the best hotel I have ever seen in China in 20 years. 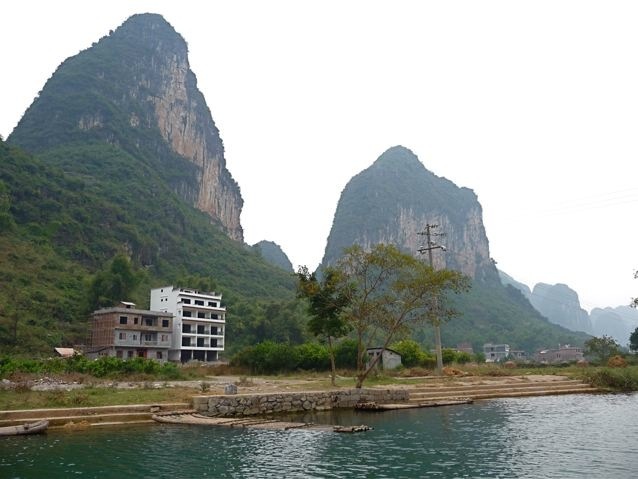 To start the trip, we took a cruise boat ride down Li River 灕江 from Guilin. For five hours, we were treated to beautiful sceneries that warrant the fame. Karst peaks thrust skyward in all shapes and forms, and the sceneries change at every bend of the river. 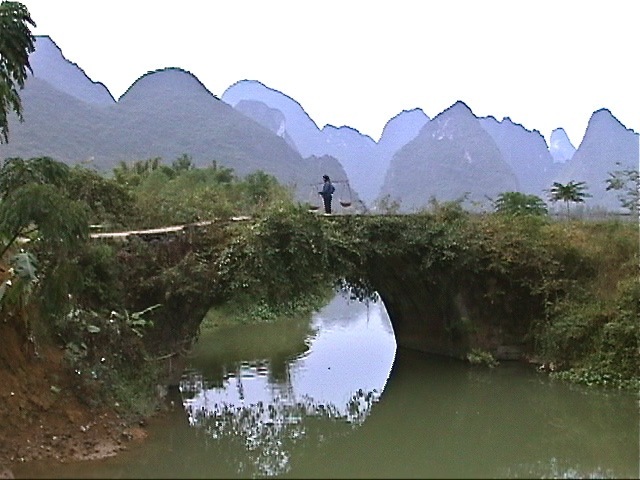 YangShuo has been the mecca of backpackers for many years. As Westerners gathered there, western restaurants sprouted and the street catering to them was renamed West Street. Seven years ago, Sally could sit on a quiet West street sidewalk mingling with local residents. Today, West Street has turned into a crowded honky-tonk garish street like any shopping street in Causeway Bay, Hong Kong. 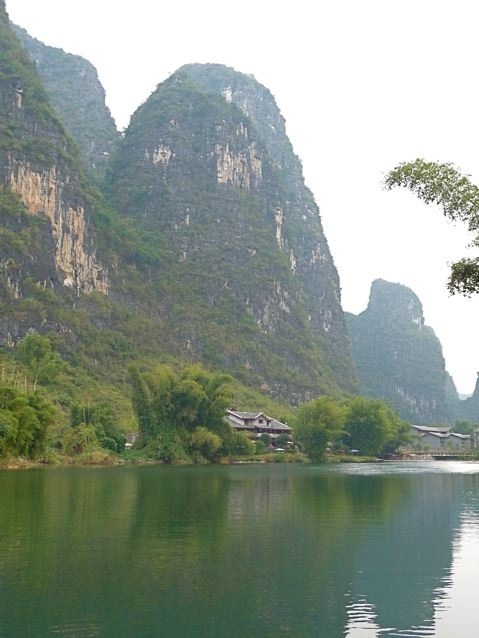 YangShuo countryside is still tranquil by Chinese standard. Here a woman carrying stuff pauses on an ancient bridge, no doubt admiring the beautiful surroundings. Scenes of expansive rice fields surrounded by karst peaks make YangShuo the most beautiful town of the Guilin area. 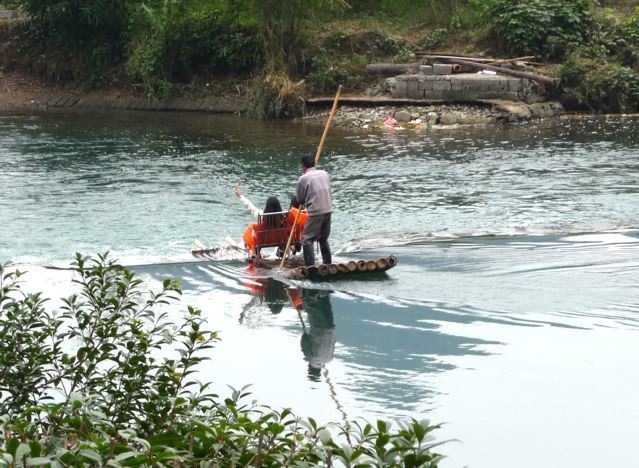 Taking a bamboo raft ride down the Dragon River 遇龍河 is a treat. Occasionally the raft passes women washing their cloths by the river. A bamboo raft rests quietly on the shore. 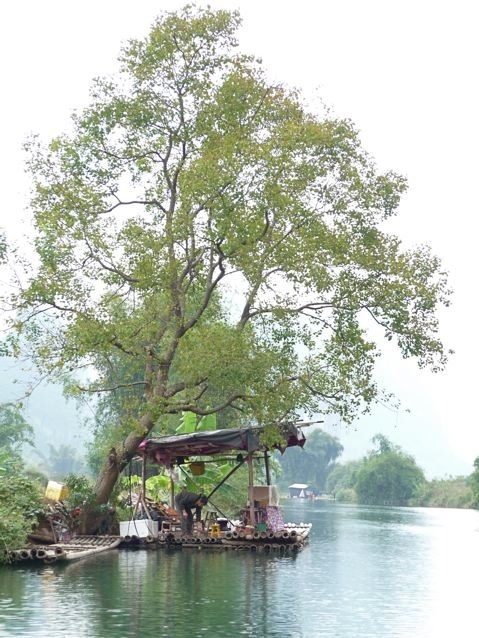 A floating vendor prepares for business under a riverside tree. Harvested rice stalk bundles on riverside. A panoramic view of the Dragon River. The Dragon River is not a big river. Weirs dam up the river and turn rapids into segments of calm navigable water. Here, a man carries heavy burden and walks across the river on a weir. 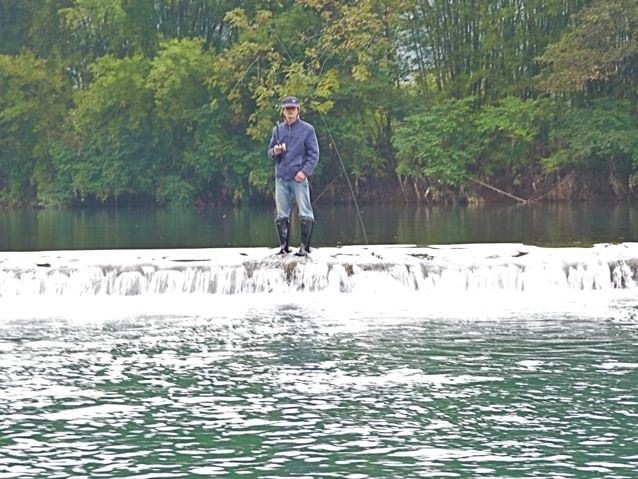 A more leisurely man fishes on a weir. 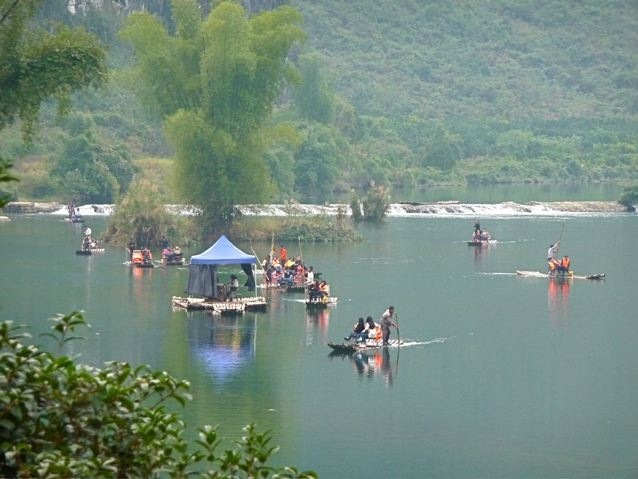 On a busy day, many rafts float down Dragon River. A raft makes a run over a weir drawing excited hollers from the passengers. A man reaps water grass from the river bed to use as feed for his animals. 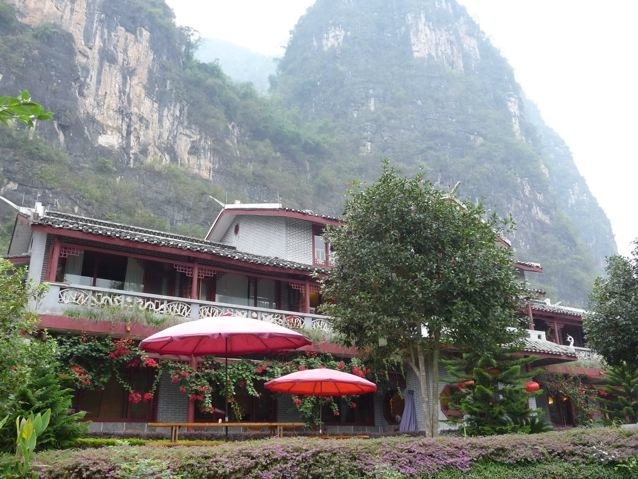 We found a little paradise in this small inn by the Dragon River and under karst peaks. 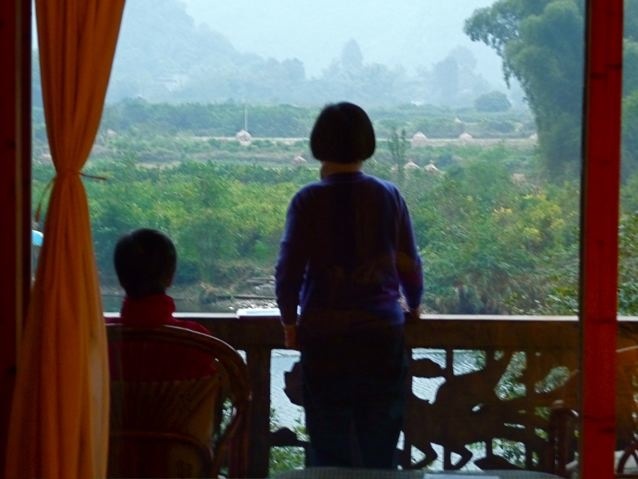 We could see the calm river in front of our balcony, rice fields beyond the river, and 27 karst peaks surrounding the fields. The view was more expansive seven years earlier, before these clumps of bamboo grew taller and obstructed the view. 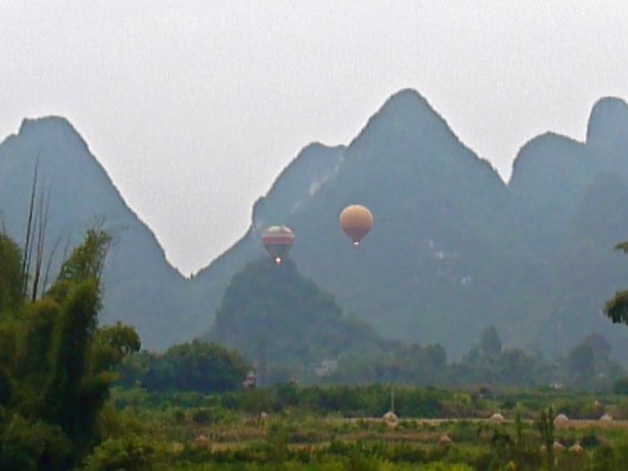 One morning, two hot air balloons floated over the rice fields in front of our room. These two persons are mesmerized by the shangri-la scene outside their hotel balcony. 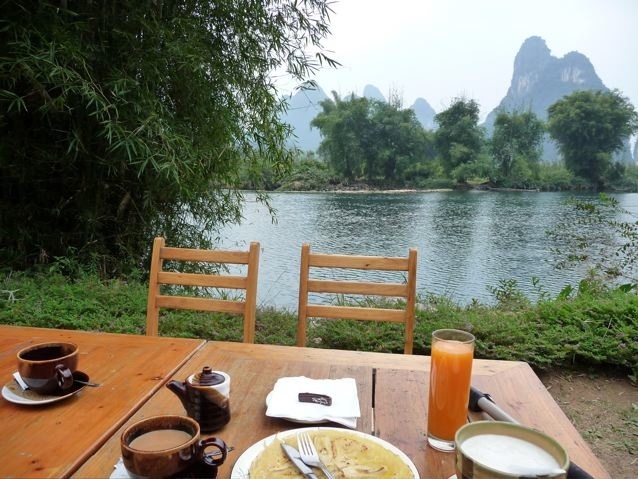 Breakfast in the early morning by the river. 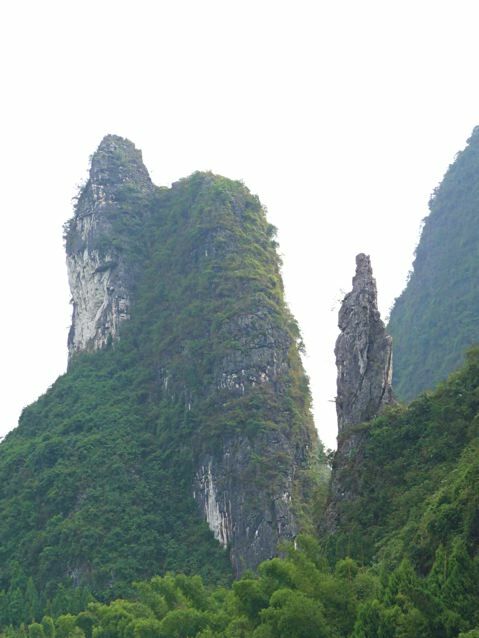 The inn was the only building among karst peaks in 2001. The dirt road behind the inn has been paved over since 2001, making the area more accessible. Another hotel has already been built not far from the inn in 2008. The paved road brings more residents to the area and houses are being built next to the Dragon River in 2008. I am afraid in a few more years, our tranquil inn and river will be tranquil no more. Posted by Robert Wu on Tuesday, December 23, 2008, at 7:52 am. Filed under Uncategorized. Follow any responses to this post with its comments RSS feed. You can post a comment or trackback from your blog.